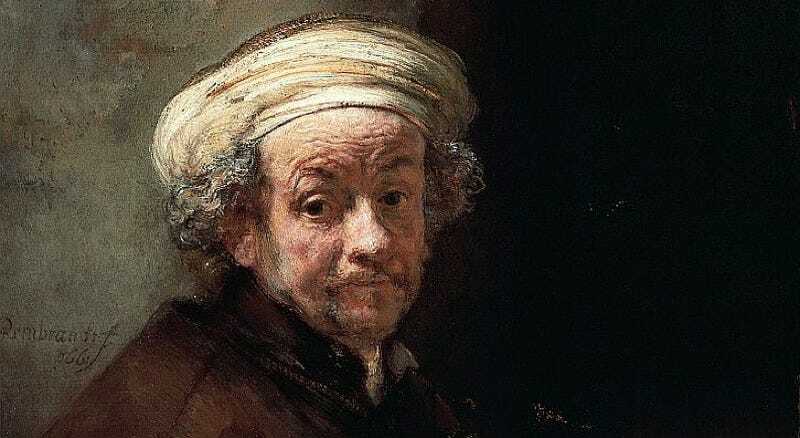 Detail from Rembrandt’s Self-Portrait as the Apostle Paul (1661). Rembrandt was renowned for his masterful use of light and dark contrasts, and the precise proportions in his paintings and etchings. Now a British artist claims the 17th century painter likely used combinations of mirrors and lenses to project images onto a drawing surface to create them—especially his famous self-portraits. It’s the latest volley in a longstanding debate about the possible use of optical aids by Renaissance artists. O’Neill had just completed his foundational art courses several years ago when he decided to spend a month in Europe, visiting all the big galleries. He was particularly impressed with the works of Rembrandt, especially the small, jewel-like self portraits. They were so detailed, with such rich textures and well-controlled proportions, that O’Neill couldn’t help wondering how Rembrandt had managed the feat. Self portrait of Rembrandt laughing. J. Paul Getty Museum, Los Angeles. Public domain. Back in England, he happened upon a BBC program about David Hockney’s book, Secret Knowledge. Hockney had broached a controversial theory that some early Renaissance painters, including the 15th century Dutch Master Jan van Eyck, used optical devices to achieve certain ultra-realistic effects in their paintings, particularly when it came to perspective. Hockney partnered with University of Arizona optics professor Charles Falco to analyze key measurable distortions in early paintings he saw as providing strong evidence for his theory. For instance, in Lorenzo Lotto’s late Italian Renaissance painting Husband and Wife (circa 1543), the geometric keyhole pattern of the carpet loses focus as it recedes into the painting, and there are two vanishing points in the detail of the fabric’s border. Had linear perspective been used, the pattern would have receded in a straight line. Instead, there is a kink in the pattern, which then continues in a slightly different direction. Hockney and Falco see this as evidence that Lotto used a lens to project and trace the pattern of the cloth, but then found he could not keep it all in focus at the same time. So he refocused the lens to complete the back portion of the cloth, changing the vanishing point. It proved to be a controversial thesis, and the debate is ongoing. But Hockney didn’t think such methods would work in the case of self-portraits. The artists of the Baroque era who used optical aids would have relied on a camera obscura effect, requiring the subject of a painting to be in a brightly lit room, with the artist sitting in a dark room. This would be impossible for a self portrait—how could the artist be in both light and dark rooms at the same time? O’Neill eventually realized it was possible to see projections on metallic surfaces, and that Rembrandt had done some of his earlier etchings on copper plates. So O’Neill bought a cheap ladies’ compact mirror—the kind with both a curved and flat mirror—and found he could, indeed, project an image of his face onto a crinkly sheet of aluminum while hovering in a doorway to partially shade himself from sunlight. “As I started to understand how it worked, it was easy to do the etching type of projections on copper, because copper is very reflective,” he told Gizmodo. Like Hockney, he enlisted the aid of an optics expert to further test his hypothesis: physicist Sofia Palazza Corner, who co-authored the paper. They figured out five possible setups by which Renaissance artists might have made projections for tracing, using different combinations of mirrors and lenses. A thorough review of 17th century literary sources revealed that Rembrandt likely would have known about such lenses and experimented with them. Small pocket mirrors and spectacles first appeared towards the end of the 13th century. Hockney reasoned Van Eyck and his contemporaries most likely owned such “mirror lenses” and might have used them in their work. One of the fiercest critics of Hockney’s and Falco’s thesis has been David Stork, who somewhat predictably pops up in the New York Times article about O’Neill’s paper citing brush strokes as counter evidence. Not surprisingly, both O’Neill and Falco dismiss Stork’s critiques. O’Neill, as an artist himself, scoffs at the notion that brush strokes should all go in one direction. Furthermore, he and Falco both point out that is highly unlikely that Renaissance artists would have created full paintings by tracing the projections with a paintbrush.